When I started thinking about putting our DIY’s into list posts I had no idea we had so many great floral ones. In the course of 4 years we have had so many flowers we could have easily hosted our very own Chelsea Flower show – ok, so I might over exaggerating a teency tiny bit but who cares, I love flowers!! Who doesn’t?! The best thing about today’s post is that, if you are a hayfever sufferer like me, all of these tutorials can be created using fake flowers instead which is a blooming win in my books! 1. 3D Flower Art: You might have seen similar projects to this on Pinterest with materials such as thread and paper flowers, but we wanted add our own unique spin and try it out with beautiful fresh flowers instead! 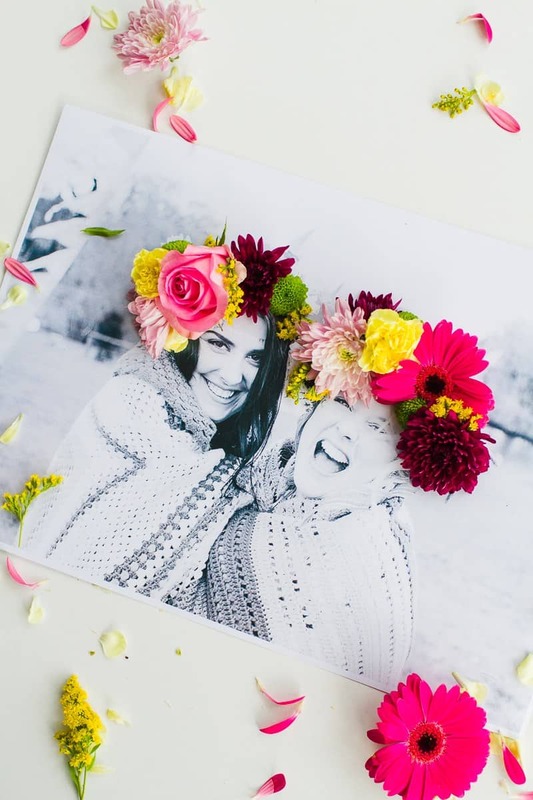 We love the idea of using photos from an engagement shoot, decorating it with fresh flowers and displaying your art at your wedding! You could even use photos from the day and display in your home after the occasion for a special touch. 2. Hanging Flower Boxes: We love how these hanging flower boxes can add a pop of colour to any plain wall. Great for a wedding, but they would even look super stylish in your home, am I right? 3. Flower Tulle Skirt: Super simple and chic and you won’t believe that it cost less than £30 to make! How amazing would this look on a wedding gown or even on your bridesmaids/flower girls? 4. Watercolour Flower Balloons: Here is how to make a simple white balloon so much prettier! 5. Naked Cake with Edible Flowers: This DIY is so quick, easy and super effective! No one would ever believe you did it yourself! Don’t forget if you decide to try any of our DIY’s, take a snap and post them to Instagram using #BespokeBrideDIY! We want to see your creations in action! These are cool! I especially love the balloons- what a different take on balloons for a wedding!